Tamerica Products has been manufacturing and providing Binding and Laminating Machines for over twenty years. Their products are made of quality material and provide a lasting value. Their laminating machine and supplies offer great quality at extremely competetive prices. 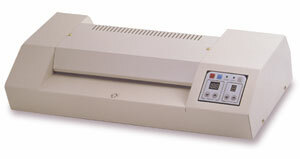 These laminators offer many features that usually are found on more expensive machines. Designed for Durability, Easy Set-Up and User Friendly! Loaded With Features Like Heated Rollers For Even Heat Distribution And Scratch-Free Laminations. Two Digital Displays For Ease Of Use, Adjustable Speed Control Plus Laminates Up To 10 mil Thickness. Laminates 1.5 - 10 Mil Laminating Film. Easy To Operate. Heated Rollers For Bubble-Free Laminations. Laminates 3 ,5 ,7 And 10 Mil Laminating Pouches Plus An Adjustable Temperature Control. Adjustable Temperature Control. Laminates 3, 5, 7 and 10 mil thickness. Coil Binding And 3:1 Wire Binding Machine With Electric Coil Inserting And Manual Wire Closing. Manual Punching And Electric Coil Inserting. Punches Round Holes. MEDIUM DUTY COIL BINDING MACHINE. Manual Punching Up To 20 Sheets At A Time And Electric Coil Inserting. Punches Round Holes. Manual Punching And Binding, 21 Disengageable Dies Great For Binding Odd Size Documents. U-Shaped Handlebar Allows For Easier Punching.